Sharon is a long standing plant-based whole food blogger over at Bit of the Good Stuff. Due to popular demand, Sharon self-published over a hundred of her recipes and created an excellent cookbook which I’m really excited about. Despite the wealth of recipes on the internet, I still love print cookbooks and desperately hope they won’t ever entirely be replaced by online ones. Bit of the Good Stuff is definitely my kind of book. It’s not only beautifully illustrated, but the recipes are wholesome, hearty and delicious and everything is made from scratch. Sharon cooks the way I like to cook and uses similar ingredients. I guess that should be no surprise as she is a fellow member of the Suma Blogger’s Network. Sharon starts by explaining the benefits that a whole food plant-based diet have made to her and her family. It must be working; her 13 year old son has not yet had a single day off school through sickness. Sharon no longer has the aches, pains and sinusitis she did before adopting this way of eating and her husband has more stamina when mountain biking and rides faster than ever before. I’m not sure I’m ready to give up dairy yet, but I feel almost tempted. If you struggle with getting kids to eat their five a day, Sharon throws in several tips on how to encourage them to love their veggies. She also outlines some of her favourite ingredients and kitchen essentials. The recipes are divided into five chapters: breakfasts & elevenses; soups; lunches & light dinners; mains; desserts, treats & snacks. Time to get stuck in. The recipes are family friendly, easy to follow and easy to make. Each one is accompanied by a clear and appealing photograph taken by Sharon herself. How cool is that? I particularly like The Good Stuff, nuggets of nutritional information that accompany most of the recipes. The recipe for Chive & Onion Frittata with sun-dried tomato, for example, tells us that “onions are great immune-boosters and are packed with antibacterial, anti-inflamatory and antiviral nutrients”. After I attended a vegan cookery workshop at The Vegetarian Society last year, I bought myself a tub of nutritional yeast flakes. It has sat in my cupboard unopened ever since; I just never think to use it. Thanks to Sharon, I now have several recipes to try it in, including Cashew ‘Parmesan’, Mac ‘n’ Cheese and Spinach & Tofu Pie. If you’re wanting to incorporate more plant-based meals into your diet or you’re vegan and looking to widen your cooking repertoire, I can’t recommend this book highly enough. You can buy it online at the Bit of the Good Stuff’s bookshop. It’s an absolute bargain at £14.99 plus p&p. For the month of January, you can get a 20% discount and delivery worldwide if you enter “VEGANUARY” at the check out. on Amazon. However, Sharon is offering one lucky Tin and Thyme reader a copy, so do scroll down to the giveaway widget at the bottom of the page and enter for your chance of winning it. I’ve only made one of the recipes so far, but I’ve got several bookmarked including: Green Pea Tostadas, Nut Koftas and Butternut Squash & Apricot Tagine. As regular readers will know, I can’t resist the sweet stuff, so these Easy Vegan Waffles, Apple Cinnamon Monkey Bread and Giant Peanut Butter Cups will all have to be tried in due course. As I’m almost incapable of following recipes and tend to use whatever I have available, I’m giving you the veggie chilli recipe I was inspired to make from the book, rather than the original Rainbow Veggie Chilli. You’ll need to head to Sharon’s blog for that or better still buy the book. 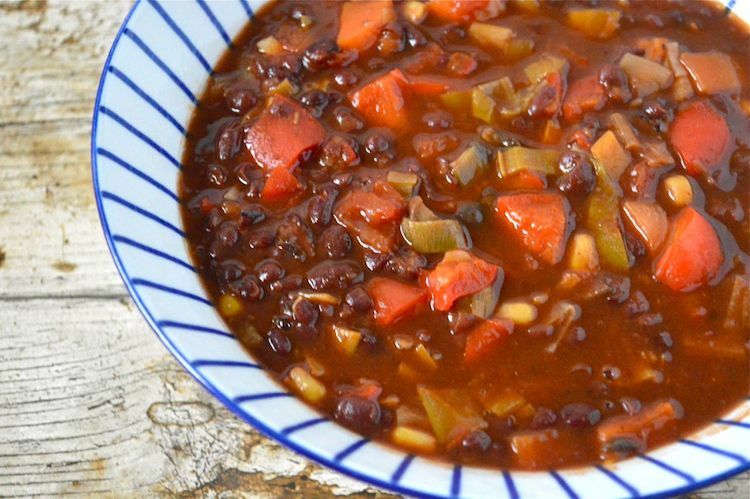 A warming hearty vegetable chilli made with aduki beans. In a large saucepan, fry the leeks and carrots in the oil over a medium heat for 5 minutes. Add all the other ingredients, cover and bring to the boil. Simmer for 30 minutes by which time the carrot should be tender and the flavours amalgamated. Aduki beans are small and tasty. Similar to black beans, but red in colour, they work particularly well in a veggie chilli. Provides 4 large servings, but could easily stretch to 5. With more and more people wanting to embrace a vegan lifestyle or at the very least attempting to eat less meat and dairy meals, Kate’s Vegan in 15 is timely. It’s a great guide for the novice vegan shopper and cook and contains over 60 recipes that can be prepared in fifteen minutes or less. It gives tips on going vegan as well as planning, shopping and cooking. If you’re worried about nutrition and where you’ll get your protein and calcium from, Kate has that covered too. She also gives a fairly comprehensive guide on stocking the store cupboard. The book contains over 60 recipes that can be prepared in fifteen minutes or less. The recipes are divided into seven chapters: Easy Brunch, Speedy Soups, Salads, Fast Lunch, Small Plates, Main Courses and Decadent Desserts. The recipes are diverse; as well as the pasta, risotto and stews you’d expect to find, there are plenty of gems such as Tahini and Cashew Quinoa Bowl with Garlic and Ginger Mushrooms. Yesterday, I made Cannellini Beans with Cavolo Nero. It was speedy and delicious, although in fact I substituted borlotti beans and savoy cabbage as that’s what I had to hand. The recipe was very easy to follow, included alternatives to the cavolo nero and a useful top tip. Today I’m thinking I quite fancy the Speedy Bean Burger with Gherkins and Mustard Mayo or maybe Black Bean Tacos with avocado and Roasted Peppers. Some of the recipes are cooked from scratch, some use ready made products. As mentioned earlier, I tend to cook most things from scratch, but it’s always useful to have a few standbys in the cupboard and I do occasionally resort to “cheat” ingredients. I’m sure I’m not the only one who is pressed for time at some point or other. I particularly like the handy little “check” symbol next to any ingredient that might contain animal products. It’s always a good idea to read the labels in my experience. The recipes are mostly unillustrated, but there are a few photographs by Romas Foord in the middle of the book to whet your appetite. I’m rather taken by the picture of the Chocolate and Peanut Butter ‘Freakshake’ and even more so by the recipe. It’s a much healthier version of the ‘Freakshakes’ that have suddenly become so popular, but it still sounds decadent and delicious. is widely available at £8.99. Kate’s blog, The Veg Space is well worth visiting too. I’m sending my veggie chilli off to Baking Queen and Farmersgirl Kitchen for the Slow Cooked Challenge. Whilst the chilli doesn’t take that long to cook, I slow cooked the aduki beans beforehand that I then used in the chilli. Sharon is kindly offering one Tin and Thyme reader a copy of her excellent book. To be in with a chance of winning, please fill in the Gleam widget below. You will need to leave a comment on this post, answering the question, which then gives you additional chances to enter if you so wish. Gleam will pick a winner at random from the entries received who will then be contacted via e-mail. If you are commenting anonymously, please give me some way of identifying you as I will be verifying the validity of entries. Any automated entries will be disqualified. This giveaway is only open to those with a UK postal address. Winners will need to respond within 5 days of being contacted. Failure to do this may result in another winner being picked. There are no cash alternatives. The book is offered and provided by Sharon Collins and Tin and Thyme accepts no responsibility for the acts or defaults of said third party. Tin and Thyme reserves the right to cancel or amend the giveaway and these terms and conditions without notice. Thanks to Sharon and Kate for the books. I was not required to write positive reviews and as always, all opinions are my own. The post contains affiliate links. Buying through a link will not cost you any more, but I will get a small commission. This helps keep Tin and Thyme blythe and blogging. I’m currently researching transitioning from being vegetarian most of my life to vegan so really excited by all the vegan foods that I can eat, rather than focusing on what I can’t! Although I’m not vegan, I do eat a lot of vegan meals and it’s so much easier now than it used to be. Good luck. Hi, I’m not entering the giveaway because I bought Sharon’s book but I just had to say how brilliant it is. Love the layout and fab recipes. I have been a vegetarian for years and have experimented with veganism twice. Failed both times as I did not make the necessary effort with planning and preparation so got a bit anaemic. However, there are many more resources out there now so I am tempted to try again. Both books sound fantastic! I am not vegan or vegetarian but I often eat vegan meals and am always looking for more tasty ideas of getting my two children to eat more vegetables! Ah yes, the perennial question of getting kids to eat their greens! Both books are well worth having with loads of ideas and information. Love vegan food – I tend to eat vegan at home, and then as plant-based as possible when out, although choice can be quite limited in some places – you’d think mushroom risotto or butternut squash was all vegans eat! I think there is nothing wrong with eating a vegan diet as long as you make sure you get the right nutrients. As for non-vegans eating vegan meals sometimes – I think it’s a good thing from what I’ve read. I like to experiment so if I enjoy a particular food or recipe, or if it sounds interesting, then I’ll give it a go. Vegan baking is interesting too. It’s good for everyone to explore different foods providing their specific requirements allow! Thanks for the review Choclette – the beans look yummy! I’ve just been reading Sharon’s book too and loving it – I have some of her Cranberry & Orange Florentines in the oven as I type! It’s a great book Kate. Congratulations. The beans were delicious and I’d never have thought to do anything quite like that without your lovely recipe. Now you’ve made me want to make Florentines! I love using vegetables as the main part of a meal and am trying to grow a variety on my allotment to produce a range of different combinations and tastes. I grew up on pulses and they form a very important part of my diet. I haven’t actually experimented with vegan cheese yet, but I will do. I have a couple of vegetarian and vegan friends, I often prefer vegan recipes as they can be much healthier and give you lots of energy. I’m not vegan but being dairy intolerant and keen to eat healthily do eat quite a lot of vegan food and it’s very nice. That veggie chilli looks so warming and delicious! I’ve been putting a lot of thought into going ‘proper vegan’, with the amount of recipes around and even the supermarkets stocking a lot more vegan food these days it does seem easier to do than it was years ago. I am not vegan but perhaps 95% of what i ea happens to be accidentally vegan. I think vegan food over the past 8 years has become very innovative and also tasty. Hello Shaheen, how lovely to hear from you. Recipes have hugely improved over the last few years and part of that is down to the work you’ve done on your blog. I’m a vegetarian who cooks quite a few vegan dishes and plan to introduce more this year. I think a lot of people forget or are unaware that a lots of everyday dishes, that they actually eat themselves, are vegan and certainly not “weird” or “disgusting” – things like a (non-egg, basic) pasta arabiatta or a baked potato with beans! I was just this minute having the very same conversation. If you have a vegetarian curry, it’s most likely to be vegan. You’ll find plenty in these books Fozia. My son has been vegan for two years and cooking for him has led me to eat more vegan meals myself. I can see myself moving towards a totally vegan diet. Oh goodness all this food looks so yummy! I want to be a better vegan but it’s difficult to find interesting recipes sometimes! I really enjoy vegetarian and vegan meals, I think there are no so many products available that the choice of foods you can enjoy as a vegan is much more extensive now than it used to be. not vegan, eat a lot of vegan meals and it’s so much easier now than it used to be. I love vegan food, the taste as well as the ethics. My body isn’t terribly keen; I need a higher proportion of fat and protein in my food than most people, but I eat it when I can and enjoy learning new dishes/bakes. Vegan or vegetarian – what’s to be worried about? It’s all just lovely food. If I see something that looks nice or interestIng I will eat it. Keep all these lovely recipes going to make us all salivate and rush to the kitchen. I haven’t had any vegan meals but plenty of vegetarian.My son eats vegan meals though so I would be more than happy to eat them too. I quite enjoy a change every so often, so I eat vegan for one month every year to sample recipes and detox a little! I have Kate’s book and am loving it but I must grab a copy of Sharon’s too – I love the wealth of good vegan and veggie recipe books which are popping up, it’s so exciting! It really is exciting. Some of my old cookbooks with vegan recipes are decidedly dull! What a lovely review! Thank you so much Choclette. I’m thrilled to hear how much you’re enjoying the book. The chilli looks delicious! Thanks Sharon. I really am enjoying your book. My chilli sadly doesn’t look half as good as yours, but it tasted extremely good. We aren’t vegans but we like vegan meals and can’t tell a huge difference. I’d like to know more in regards to vegan food and recipes. As it is good to be aware, informed and prepared. As I would want to offer any visitors to food which they enjoy. Chili is one of my favorite things to make and this looks so hearty and delicious! Yum! Good luck Lauren. I think if you feel better for it, you know it’s the right thing for you. I can definitely recommend either or both of these books. There’s lots of nutritional info in them as well as fab recipes. Veggie chilli is so versatile nad its great to serve with pasta or rice. I love your recipe , its great for winter too. I love the giveaway too , both books are lovely. I think there’s a misconception that vegan food is boring. It’s not at all! As a vegan of many years I’ve enjoyed trying out new recipes from around the world. It certainly opens you up to new ways of cooking. Vegan foods for literally everyone and it’s great to serve at dinner parties as there’s no risk of offending anybody…as long as the food is tasty – everyone has a great time. I never like to add meat to my chilli so any veggie chilli recipe are welcome. I know the feeling. I’m a dairy addict, especially cheese. I think Vegan food wopuld be very healthy. Ooh not necessarily Sally. Vegan food can be full of all sorts of horrid fats, sugar and other non-desirables. I was always unsure of Vegan food as it seemed quite plain and boring but over the last couple of years it has become more appealing, I definitely think I will try and go vegan in 2017. I’m not vegan but I find there’s more variety in vegetarian meals rather than vegan meals. I have cut down the amount of meat in my diet and replaced with vegetables but a world without eggs seems a little too far. Just the thing for this freezing weather! Yes, warming chilli, curries and soups are my mainstay at this time of year. Some of it is very nice and makes me think about becoming a vegan. I really need to pick up both these books for a good gander. That chilli looks so good and Kate’s recipes are always fab. They are both well worth having on the kitchen bookshelf Jac. Not everything manages to make it to mine as I have so little space. Not vegetarian but fancy a couple of meat free meals a week to save on cost. Some of these recipes sound really tasty. Thank you very much for sending your veggie bean chilli into the Slow Cooked Challenge. Slow cooking your beans is a great way to save money too rather than buying the tins, aren’t dried beans such great value. The chilli looks so rich and full of flavour, I will give it a go! Thanks Lucy. Dried beans are not only cheaper, but they taste so much nicer than the tinned ones I find. I have reduced my meat intake but still love small quantities of quality meat.Our overall diet would improve if more people ate fish,especially oily fish like sardines and mackerel.I’m increasing the fish in my diet. Although I’m not a Vegan, I’m very interested in Vegan food. I try to incorporate it into my diet, as I think it is very healthy and good for you. Although I am not vegan I cook a number of vegan dishes at home. I was really inspired by the dishes I tried at Vegan Life Live in January . What an interesting and thoroughly enjoyable post. I was delighted to read about the recipes you had made from the books. It’s a good review and very encouraging to actually get these books because you have shown what some of these recipes are like to cook and how they taste. Food always looks delicious in cookbooks but often they can be a real faff to make for yourself. Thanks Katie. Pictures are food for eyes rather than tastebuds and often disappoint I find. Or, as you say, involve a lot of faffing about. I’m a vegetarian and eat a lot of vegan food, as I really enjoy it. Thanks for the giveaway. I’m not a vegan myself but do like to try recipes and make an effort when my niece visits as she is a Vegan. I have yet to see Sharon’s book, but have heard so many good things about it! Kate’s is fantastic, just browsing through it now! I’m vegetarian so I do eat a lot of vegan food – I don’t think I could manage being vegan myself but really respect those who are. My thoughts on vegan food are that there are many vegan dishes I really enjoy 🙂 and the choice is so much greater than it used to be. Definitely doesn’t have to be bland and boring! I used to think that they were bland meals and that they wouldn’t fill me up. But for the last 18 months I have been slowly eating more of them and am finding that I really enjoy them. It is also great to find new recipes to try. I think it can be tasty but I couldn’t do it all the time! Im not vegan but often order a vegan meal in restaurants as they use ingriedients I am a bit scared of but are so yummy! I’m interested in vegan food, but not confident enough in my cooking skills to give it a go. It sounds tricky to maintain but nice for the odd meal here and there. Im not a vegan as i love Dairy and Eggs too much but there are some vegan recipes that we enjoy as a family on a regular basis. I’m not a #full vegan’ myself but I have plenty of friends who are so I eat a lot of vegan meals. They are tasty, delicious and perhaps more surprisingly to people – versatile. I’m certainly working towards becoming a full vegan. my sister is a vegan even though I’m not, but the food is still really tasty. I would love to be vegan but with having a nut allergy I think my choices would be very limited. My good friend is vegan and she is so fit and healthy. I want to be like that. I am trying to do a vegetarian meal once a week for a start. Vegan food is the best- it is healthy, tasty and you can feel good about yourself as you are eating it, as you know that you are helping save the planet and prevent cruelty to our furry, scale and feathery friends. My daughter is vegan, we have experimented with recipes , has really enjoyed most of them. I have used a fair bit of chickpeas and coconut milk. I’m vegetarian and also lacto-intolerant, so I eat a lot of vegan food. Pretty much all the food I cook for myself is vegan, but if I eat out it’s usually easier to find vegetarian dishes rather than vegan ones. And if I’m offered cake I find it hard to resist! I am Vegan and one of my daughter’s is vegetarian. I love the wide range of delicious recipes that are now available for Vegans. Things have definitely improved in recent years – thank goodness! That’s interesting to hear. Hope it works for you and good luck. I’m not vegan, but I have had some great vegan meals. I’m a vegetarian but also eat vegan food – its healthier and less fattening. I would be a vegan but I am worried about the protein without meat, but I have enjoyed some great vegan meals. There’s plenty of advice on protein in the book Karin. I’ve been vegetarian for almost a year & would eventually like to go vegan. At the moment I only eat cheese & milk products a couple of times a week. I think that vegan food is delicious, if it has lots of herbs and spices or else it can be very bland.